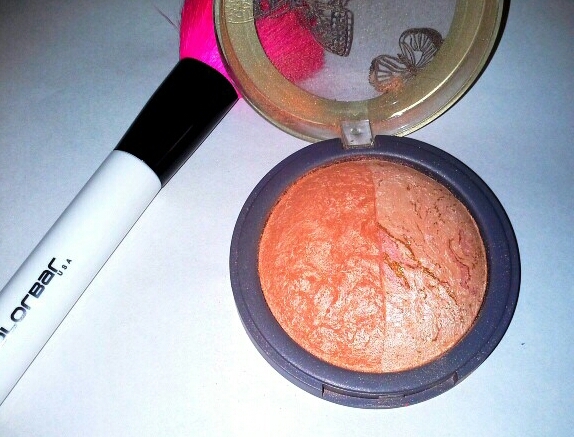 Sunkissed or tanned, either way you’re gonna love Accessorize’s bronzer in Laguna! Funny how words can prod, twist and finally manipulate us into thinking that the same idea is perhaps part of two different ideologies. We tend to perceive the same thing as two different entities, one good and the other bad..simply because of the words chosen to represent either! Let me help you again at this point- tanning which is essentially getting darker is treated as a no-no in India (with the fairness bug biting folks continuously for centuries, maybe millennia! ) but being sunkissed or bronzed is now being accepted in our society! Why? Aren’t the two same? Whether you tan or get smooched by the sun, you are getting darker and yet why is being sunkissed accepted more than being tanned? Words! See the point? I too jumped onto the tanning/bronzing bandwagon sometime ago. 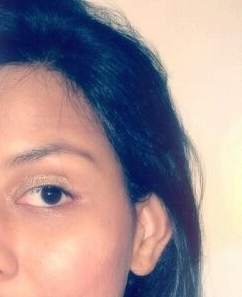 I’m pretty much Indian and maybe to the rest of the Western world, we folks are gorgeously tanned all year round, but I tend to go a little pale and colorless in the face, which I’m not liking of late. I am obsessed with Accessorize and keep purchasing lovely bags and clutches and earrings from them whenever I find myself with money to spare. For me, this purchase is a double whammy since it’s my first makeup product from Accessorize and also my first bronzer! Laguna retails for Rs.750 and is a gorgeous duo color bronzer with a dark, peachy toned color on one half and a pale pink highlighter on the other. It’s got this beautiful marbling characteristic of baked products. The container is plastic with a very pretty detailing on its lid. Lovely dainty butterflies! I apply it with a fluffy powder brush and it works beautifully in giving me a bronzed glow with 2 light handed applications. Go heavy and you’ll risk looking like a sun baked baboon! Tips : Powder color products like blushes and bronzers usually go deeper on the skin due to body heat. So majority of the times it takes minimal application to get the desired look. When using powder bronzers, always powder your face after foundation to maintain the same surficial texture for easier blending. 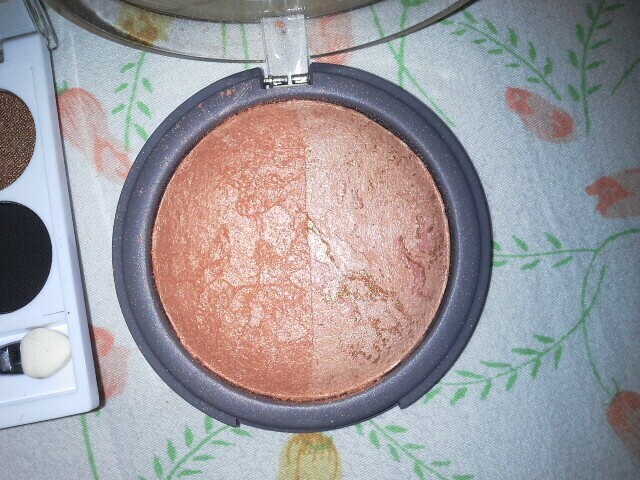 Powder color on cream or liquid will go patchy and not merge. The shimmer is fine and not at all gritty and this helps give a great healthy glow! 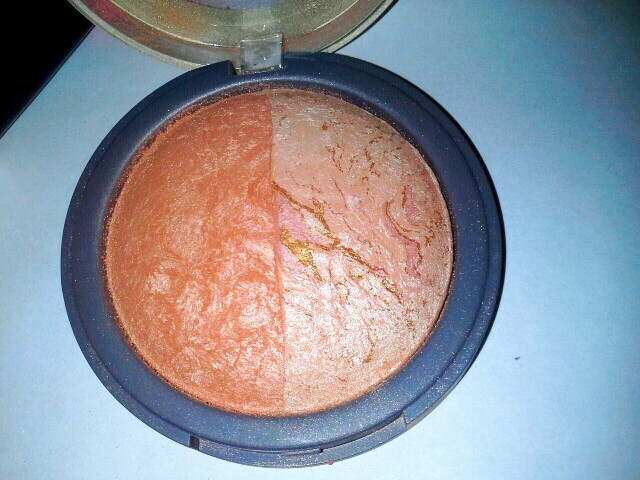 My only grouse with this bronzer is that it has a lot of fallout when swirling the product in the pan! Lots of powder falling off and flying here and there! Thankfully, once on the skin, it doesn’t transfer. Phew! 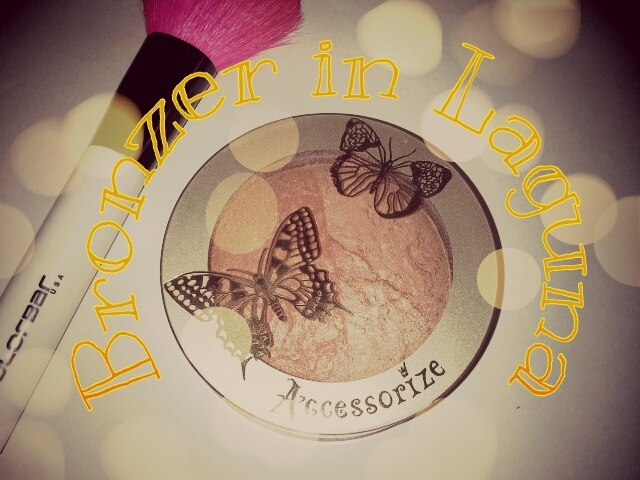 Product Name : Accessorize baked bronzer in Laguna. Price for Quantity : Rs.750 for gms. Great starter for those new to bronzing. 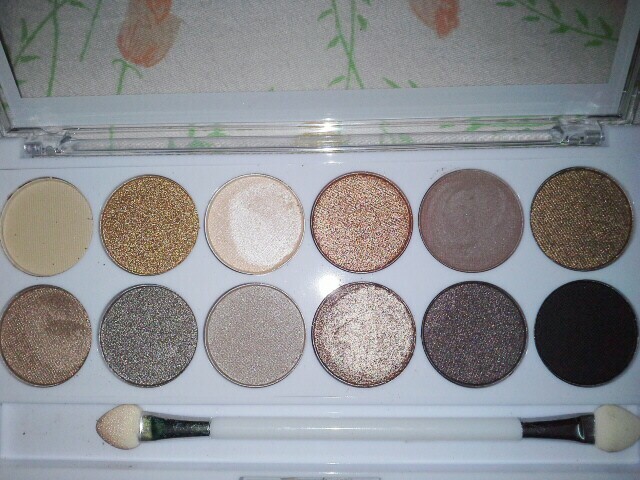 Lovely quality and no chunky shimmers. Does not cause breakouts and fine for oily pimply skin. Baked hence can be used wet or dry depending on intensity. Lovely color payoff and buildable with less pigmentation and this my dear ladies is the biggest pro for a bronzer, remember the baboon! Cons : Lots of fall offs! Can stain clothes if not careful when applying the powder which has a loose hold despite being compressed! Update : I have removed my fotd due to security reasons. If I ever change my mind about how comfortable I am again to show my pictures, I surely will add them back. Hope you’ll understand! 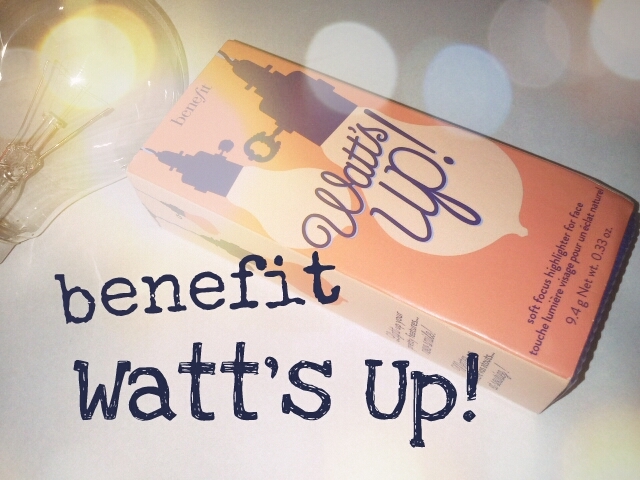 Review : benefit cosmetics Watt’s Up soft focus highlighter..love at first glow! You remember what I’d said long back, if it’s a cult product, I will not only dupe it but also get it! It’s got this lovely soft ombré orange carton packaging with lovely early 20th century looking bulbs as the main design element.A soft blue colored cursive font for the writing is just there! Lol omg, vintage stuff really gets me cracking, doesn’t it? Lol anyway.. 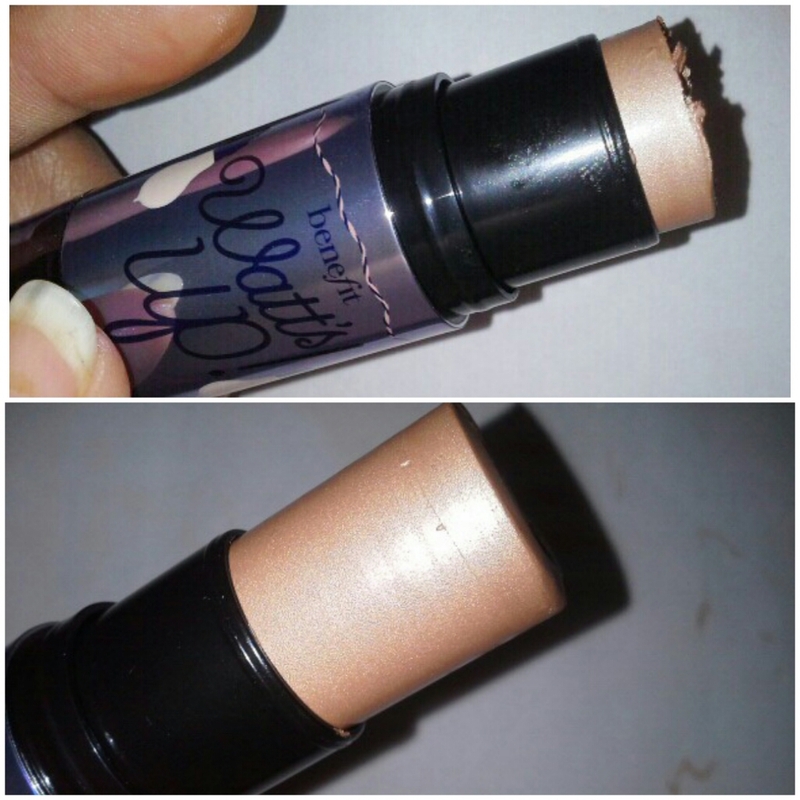 The product is a champagne colored creamy stick that has a cream to powder finish. Looks beautiful! Although it’s a love affair for me, what pinches me apart from its $30 price tag is that the sponge shown in the photo below is a complete waste! 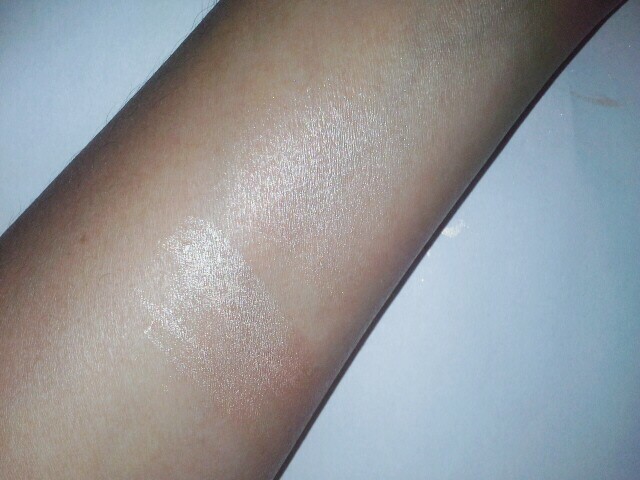 It blends superbly with the fingertips and the damn sponge just blots out the champagne shade and the leaves behind just the shimmer! Pfft! Makeup Tutorial : Acne covering routine. Finding the right shade of foundation, powder or concealer fit for my part yellow, part pink skin undertone has always been a chore for me. Even then, I have always managed to find shades that are of the closest match. 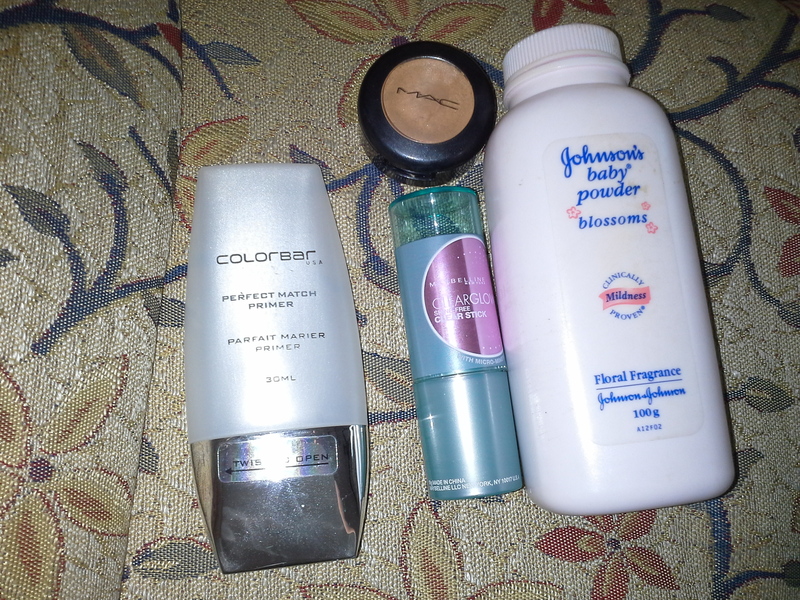 However,there are days when my “perfect” concealer seems orange on me and the foundation too pink/gray! And to add to it all? Acne. It’s so.damn.irritating. But amidst all this, I have found a routine that makes my face look less yellow, less pink, my acne less red and my damn oily skin more matte! 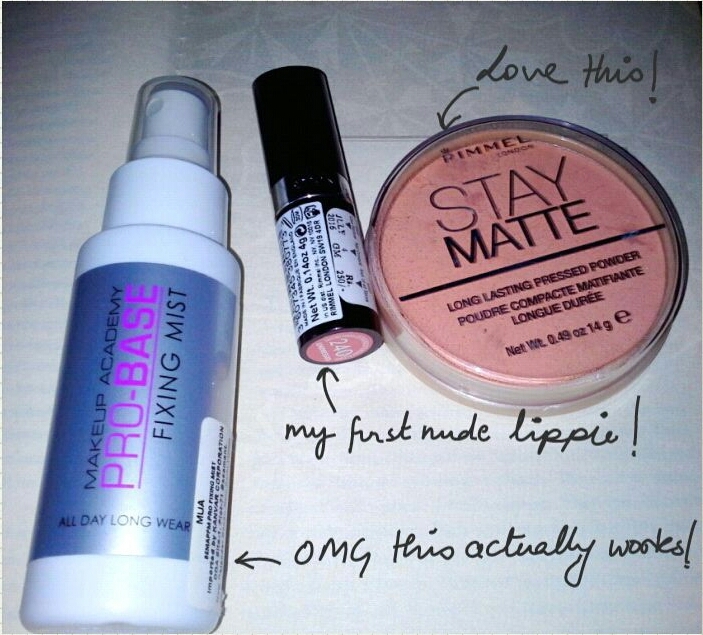 So here’s a quick look at how I conceal my acne and the products used! After cleansing my face, I apply a light, oil-free moisturizer. 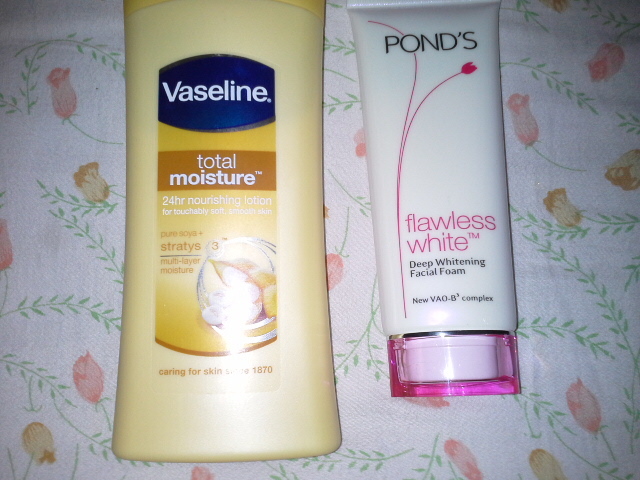 Following which, I apply a clear gel based primer to smooth out my bumpy skin. I then apply my foundation or like in today’s tutorial, a BB stick with good coverage to eliminate the need of a concealer as much as possible. I then spot apply the concealer after, on pimples that are visible. Please ignore my super dry skin. I’ve been so taken with Alessandra Ambrosio’s makeup ever since I saw her on Vogue’s Cannes ’13 spread. I wanted to recreate the look and here it is. But first, let’s look at the inspiration.. I prepped my skin with a radiance enhancing hydrating primer (no moisturizer as my skin is unnecessarily oily nowadays) and followed it by BB stick and concealer. For the cheeks I avoided a blush as it would seem heavy against a light, dewy look and instead used a cheek stain to get a natural looking flush. Spritzed my skin with a finishing spray to give my skin that overall dewy look without adding any highlighter. For the eyes, I first lined it with a dark brown eyeliner and brought it down to the outer 1/3rd of my lower lash line and smudged it. Added a gold eyeshadow onto my lids by patting it heavily to look dramatic in real and visible in photos. 🙂 Added 2 coats of mascara and also filled in my brows. For the lip, I patted on a bright fuchsia pink lipstick, almost neon, with my fingertips to soften its appearance and dotted a colored lip balm only on the center of my lips to give it a natural look. Let me tell you, it turned out to be so wearable and natural looking yet so glamorous, thanks to the gold eyeshadow. Today I’m reviewing my first individual powder blush purchase ( see I told you, I’m a blush novice) which I made after constant and careful thinking. I have been using only The Body Shop’s lip cheek stain in 01 Rose Pink (?) for a couple of years now as it gave me a nice natural looking flush without any extra weight on the face or sticky unnatural feel..fabulous product. 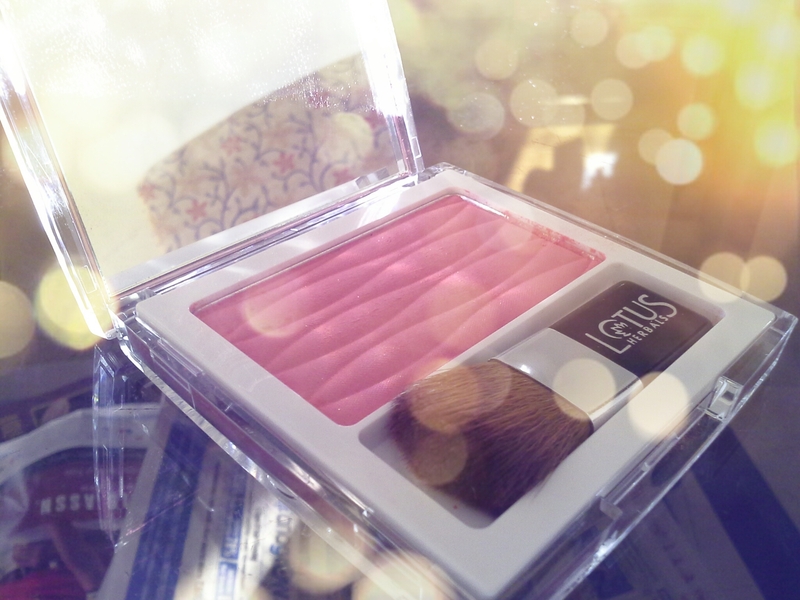 But I really wanted to try the powdery blushes which gave a very sophisticated look to makeup and completed it. 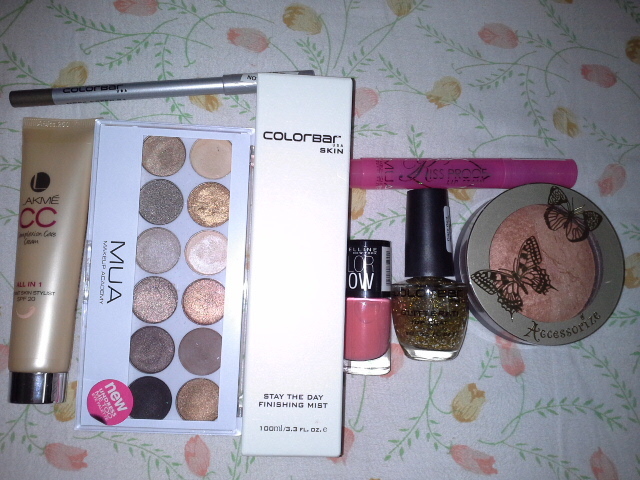 I have a makeup palette from Sephora which has 3 blush shades, but think they’ve expired..pretty old so I don’t use it. I wanted my first blush buy to be from a reputed brand and something not loaded with unwanted so called minerals and chemicals to irritate my acne prone skin. 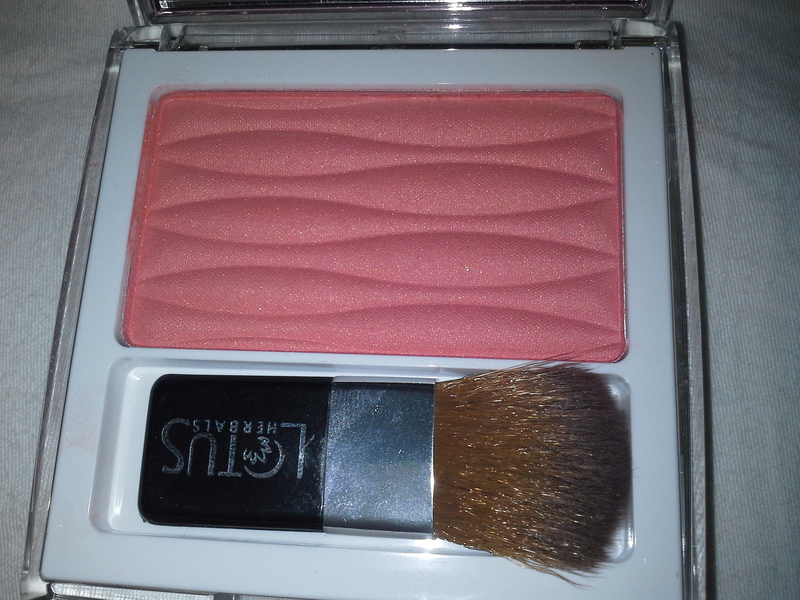 And so I zeroed in, on the Purestay range of blushes from Lotus Herbals which makes 100% vegetarian makeup. 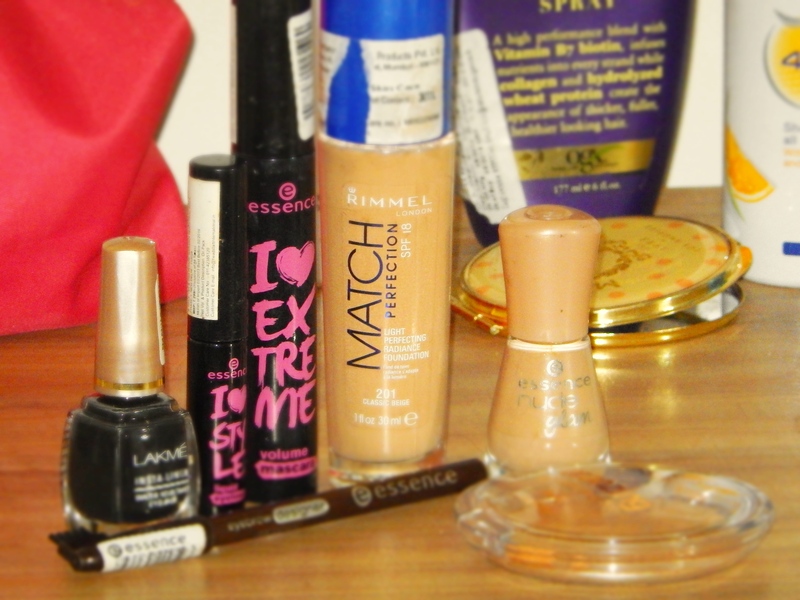 It includes foundation, powders, lipsticks, glosses, eye liners, mascara and eye shadow palettes. 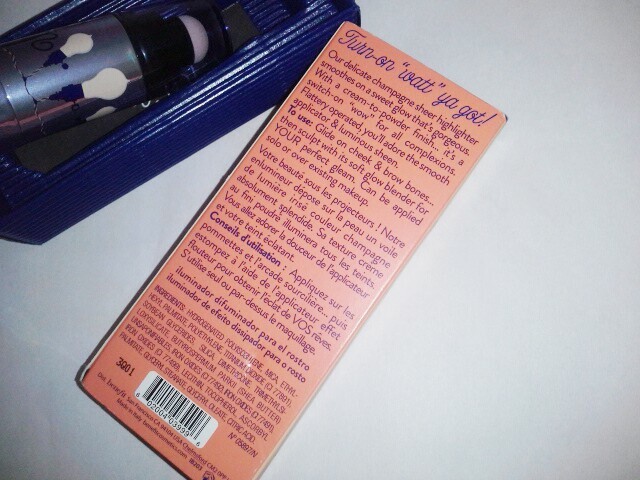 I bought this peachy, rose shade with very teeny tiny golden shimmer called Rose Kiss. Price for Quantity : Rs. 595 for 6g. I got it for Rs.545 online. 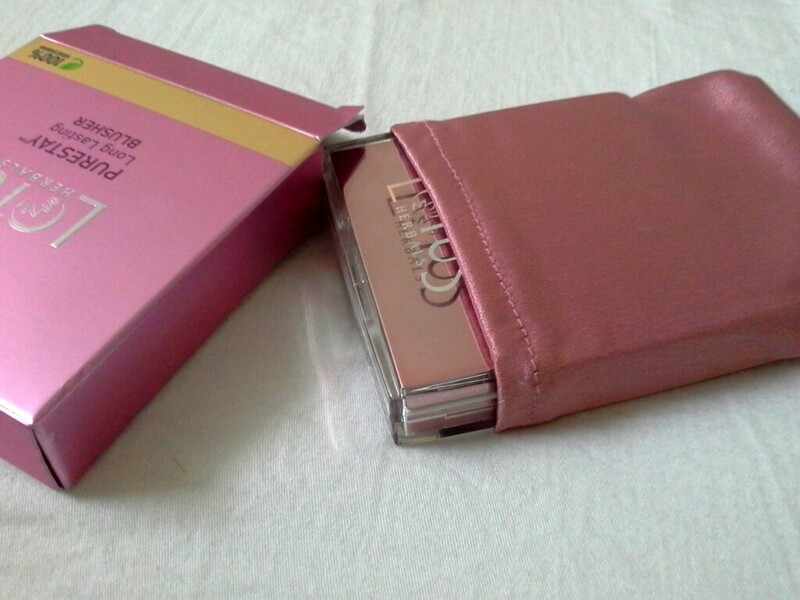 Packaging : Comes in a luxurious satin pouch which can be used to store earrings too! 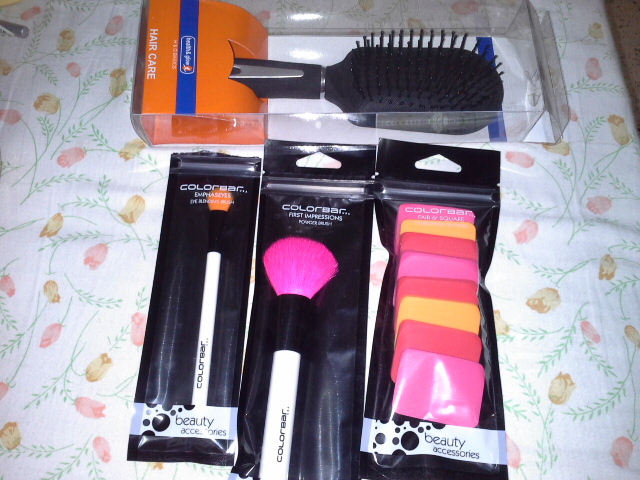 A solid plastic casing with a built-in mirror and brush which is of good quality.Looks rich, which is a plus point for me! Texture : Seriously finely milled powder with a silk feel. Totally weightless no matter how much you pile on. Pigmentation : Good pigmentation even when worn sheer yet buildable making it great for everyday wear.Starts off as a very light wash of peach and gradually migrates towards a more vibrant peachy pink upon layering 2+ times. 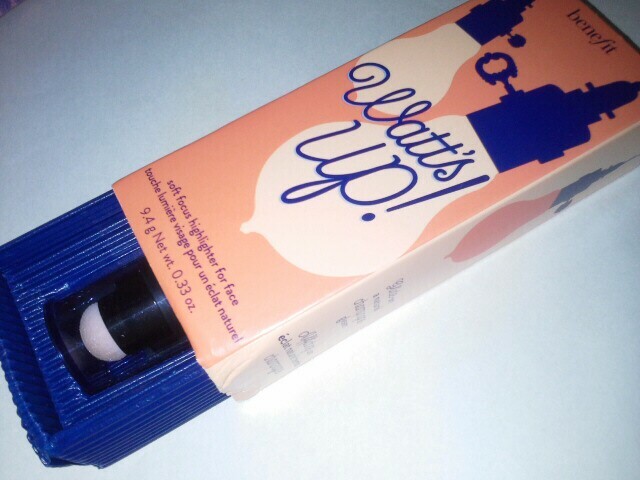 Wear : It wears for about 3 odd hours on my super oily skin after which it begins to fade evenly. So no blotchy cheeks, yay! Skin compatibility : Does not react weirdly with my oily skin or break me out. Conclusion : On the whole, I love this blush and that it’s formulated without any harmful ingredients (hopefully) makes it a great buy! 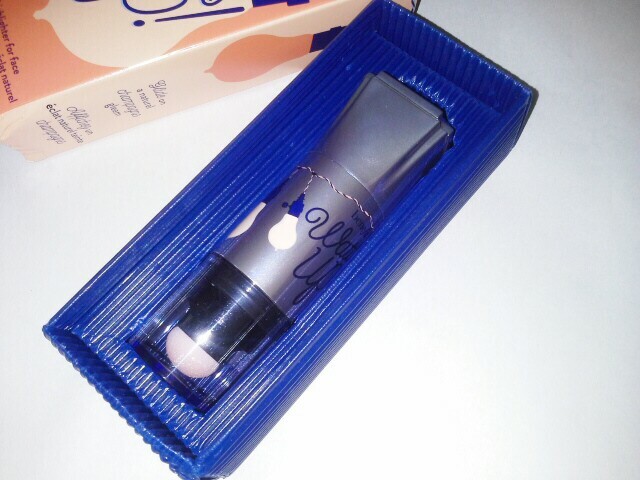 Light on the skin with a great texture and decent wear time on oily skin makes it a delight to use. However I would like the price to be below Rs.400 but then again, I can pay for assured quality. Also, saying that it’s 100% vegetarian and preservative free is great, but I’d love to have the ingredients printed on the carton. 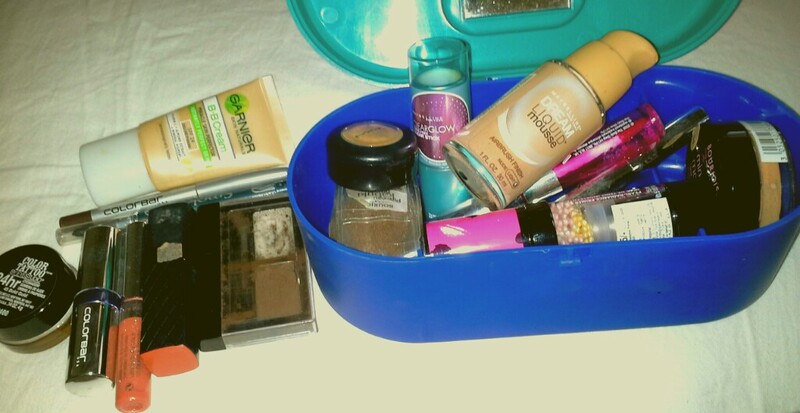 What’s in your vanity?A peep into my vanity box and tips to help you stop hoarding makeup! Everywhere you turn, you find lots of makeup blogs that do a fabulous job of enticing you to buy the myriad products out there from a variety of brands! Call it high end or drugstore or whatever you fancy, makeup costs money and it doesn’t come cheap unless you’re ready to compromise on quality. 1) You have dozens of bookmarks pointing to various makeup blogs. Now this is the first sign of obsession and I too fell pray to it, hehe. I had bookmarked at least 15 different sites and followed a dozen others. It was great no doubt, to understand makeup, its facets and how other ladies perceived it and played with it! I was even influenced to buy a couple of stuffs ‘coz it constantly appeared in other blogs, totally being raved for how fantastic it was! 2) Your wardrobe consists of more drawers for makeup than for undergarments! Now that’s sad. Undergarments are what you need in dozens from purely the point of hygiene and comfort and to not be caught on a day where everything’s in the laundry! But what if you have instead, a drawer for your bare necessities and four for makeup? 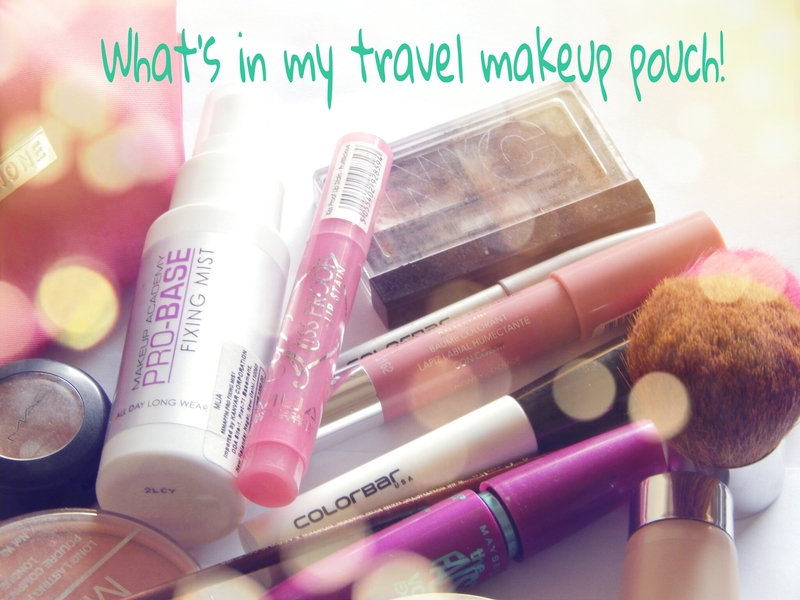 A serious case of where you are obsessed with buying makeup! Hmmm. 3) You hit the makeup counters a soon as a new product hits the market- everyday and you talk in terms of spring summer collection and other such nitwit jargon! Now you, my friend, are diagnosed with a dangerous obsession over makeup. The end. Now if you are convinced enough that you are sadly a victim of makeup blog circumstances, find out how you can pull yourself out! 1) Eliminate options to arrive at what can possibly be your right choice. 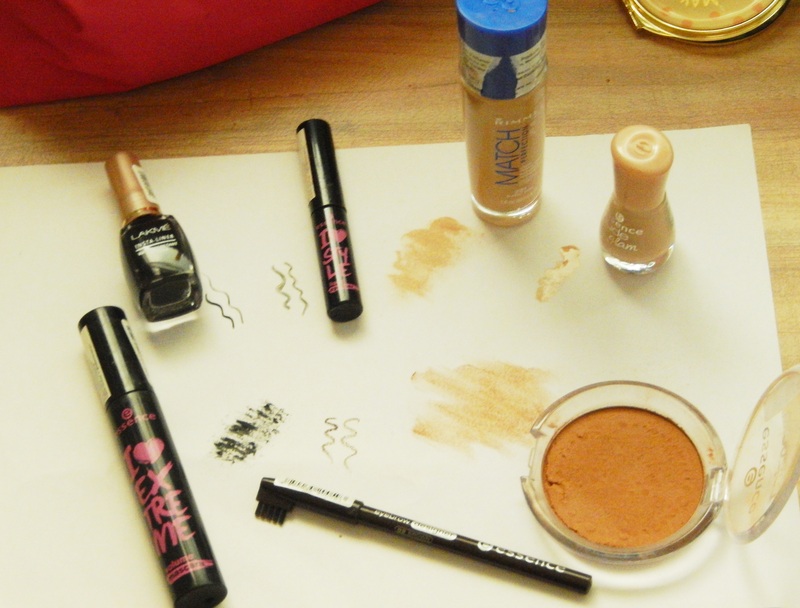 Let’s say you have lusted after 4- 5 foundations that seem to be constantly in the limelight. Please go and read about it in their respective product sites/catalogs to understand what it does for you and if it’s at all meant for you. a) A matte/oil free foundation for the summers. b) A dewy/water based foundation for the drier climates. If you have a collection worth displaying at a shop’s window, stop right now! Go through your kit and discard anything you feel is unnecessary. Add 1 creamy concealer to the list since no matter what be the weather, a creamy concealer is your best bet as dry, scaly covering over spots and circles will only worsen and highlight what you are trying to hide. Keep 1 blush/bronzer, 1 lip/cheek stain and 1 highlighter to play up your features as per your desire. Unless you’re a makeup artist you don’t need a book-palette full of eye shadows, like seriously? 2) If every other blogger is reviewing a certain product at the time of its launch, know that it’s sponsored. That’s pretty simple and it is a known fact. PR companies send out samples to blogger to review it and write it out on their blogs. So what you may buy after running to the store and paying a hefty price just because you saw your bookmarked bunch review something, does not mean they too bought it. They were given those products for reviewing and publicity purpose.If you usually don’t know that, read the fine print! Usually decent bloggers who follow the ethic write in fine print that it was given to them. No you decide if you want to blow up your money over every single product you constantly see appearing on all popular blogs(see the underlined text above). 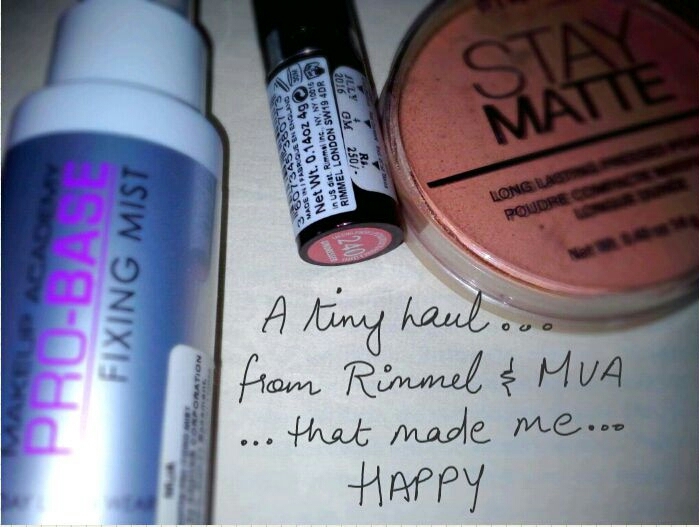 As a general rule of thumb, note that almost 60% of the products reviewed by popular bloggers is PR stuff. End of story. So the next time you see a huge godzilla like collection of makeup products with a blogger, please remind yourself this point. 3) Products have expiry dates. Now this is such a bummer and still people fail to realize that hoarding makeup is only a mega hole in their pockets as every product is bound to expire within a year even though the label says 3 years. Mascara takes 3 months to expire. So by the time you decide to empty a bottle, 3 others would have expired. 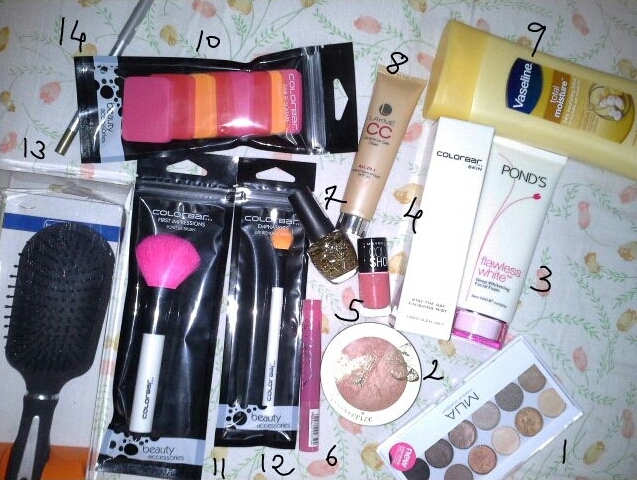 4) Bloggers hold “Sales” of used products and benefit from it.